Our running group had a couple participants this year, and I hooked up with a local friend whose sister would be running. Her whole family was coming for the event, and they happily let me crash on the couch of their Airbnb to join in the fun. Now, I’ve never in my wildest dreams thought I could run the Boston Marathon. Me? Slow me?? Previous 5:15 and 4:52-marathon me? Nope. Boston is for fast people. Sure, Boston is definitely for the elite crowd. For the way-faster-than-average-Joes in the 18-34 year-old-range. BUT. Boston is also for slow people who have worked hard to get fast(er). Boston is for people who appreciate the extra five or ten minutes they get when they age up (Happy Birthday!). Boston is for the charity runners, the dreamers, the don’t-stop-until-you-make-it runners. If you want to get there, you can. After being there and seeing the runners, this is what I took home: the dream that I, too, can qualify for Boston, and after my 3:48 marathon this past fall, that dream may become a reality sooner than I would have imagined. OK, back to Boston. 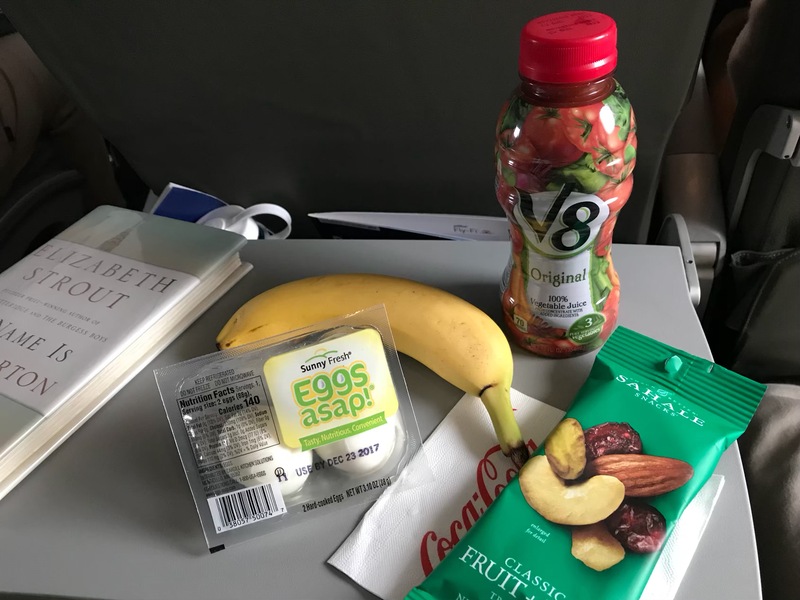 I landed at approximately 7:45 am on Saturday morning and navigated myself from Logan Airport to The North End (a.k.a. Little Italy) via public transportation. I credit 100% of my ‘independent traveler’ skills to Andrew, who has taught me well. Thankfully, Boston isn’t crazy big and the subway system is relatively easy manage, but I figure if I can do it in a foreign country, I better be able to do it in my own. First stop was Mike’s Pastry, on Andrew’s recommendation. Apparently, the line for cannoli is out the door every night, but when I arrived at about 9 am, the block was pretty quiet. 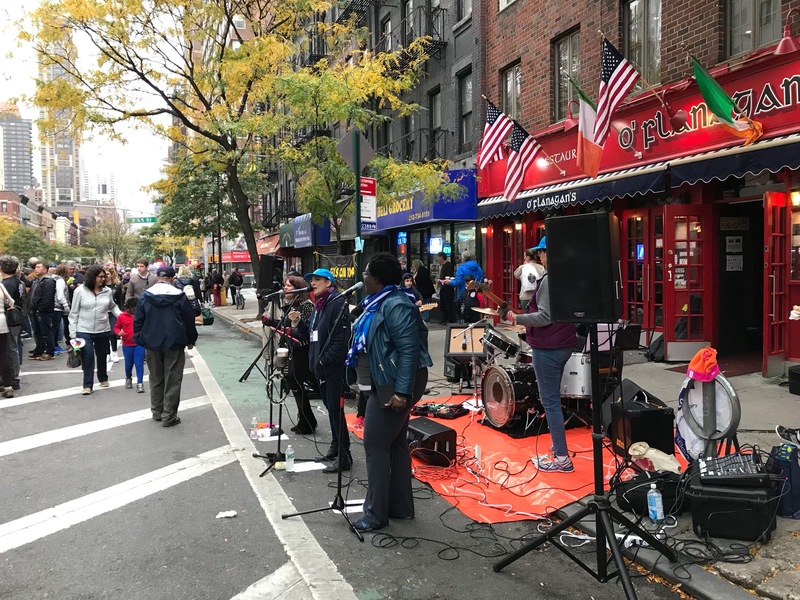 A few 5K runners were trickling in for treats and burly men speaking Italian were busily loading delivery trucks with wide, shallow boxes of pastry. I walked up to the counter and asked the girl what I should get. As in, if I’m only getting ONE THING, what should that one thing be? She quickly pointed to a cannoli with chocolate chips on either end. Now, I didn’t even think I really liked cannoli. I don’t even really like chocolate chips unless they’re a little melty. In fact, a cannoli is exactly the LAST thing on a dessert menu I would order. One bite in, and I knew I had found something special. The shell was absolutely perfect–thick and dense yet crackly. The filling was slightly sweet with a hint of that ricotta. The chocolate chips were the perfect touch. There were dozens of different filling/topping combinations, in addition to other pastries and gelato, but I’m glad to have tried the ‘original’ version. I polished that off in short order and headed back outside to explore. I back-tracked to the Boston Public Market and found an outdoor farmer’s market just waking up. It reminded me of mornings in Europe, where flea/farmers’ markets abound. Knowing I had some time to kill before meeting up with my friend that afternoon, I decided to pop into one of the visitor’s information offices to pick up a city map. It detailed the ‘Freedom Trail,’ a easily walked tour of the city that includes the many historical highlights from the Tea Party era. In addition to Benjamin Franklin (below), I saw the State House, Park Street Church (where my highschool friend’s husband is a paster–she is below as well! ), the Granary Burying Ground (Mother Goose may be there! ), the site of the Boston Massacre, Fanueil Hall (closed for renovations) and Paul Revere’s house, which is located in the North End. Boston Common is about halfway into the Freedom Trail, and it was nice to segue through the park and see everyone doing their thing: running, children playing, walking dogs, sitting and talking, etc. 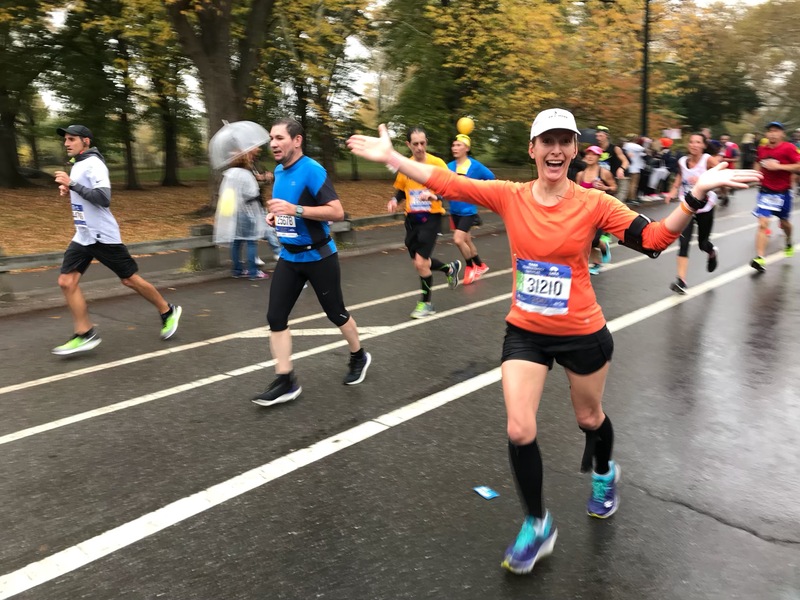 After the park, I made my way to the finish line on Boylston Street–so exciting! Set-up was underway the entire day, and it was fun to be able to check it out up close. I didn’t know it at the time, but I’d be viewing the race from the Boston Public Library, which is the building on the left AFTER the finish line (in the photo below), literally just above the grandstand. Connections, man. And with the terrible weather that morning, we were very glad to be out of the elements! While I was on Boylston Street, I stopped for lunch at The Parish Cafe, where I was able to charge my phone and enjoy a delicious sandwich and cold beer. After even more walking (and maybe a quick stop into Athleta! ), I met my friend at a local coffee shop before we took the green line out to Riverside and caught an Uber to our Airbnb. 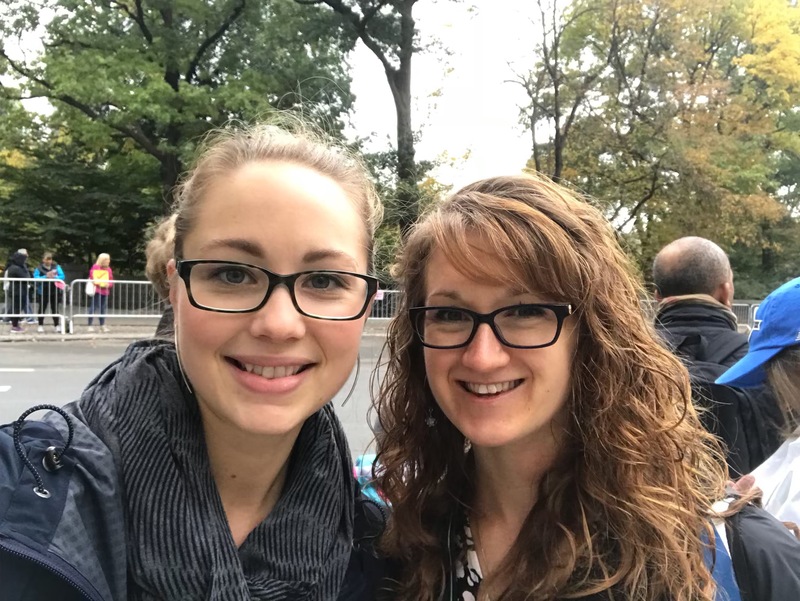 My friend, Sara, and I had the entire day Sunday to explore the city again! However, we quickly realized we had not packed warm enough clothes for the sudden change in temperature! We couldn’t believe that the girls from Buffalo were so unprepared for the cold. Who knew mid-April could be so wintry-feeling? 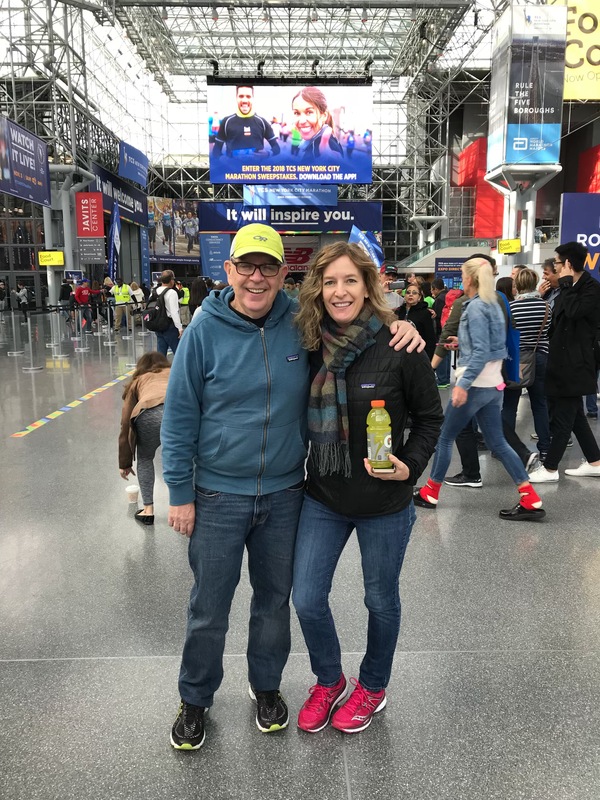 We headed back into the city in search of hats and gloves to get us through the day…along with every other marathon spectator; stores were selling out fast! Thankfully, Boston has an incredible shopping district and we finally, we hit pay dirt at The North Face and picked up their least expensive hats–twinsies! We grabbed lob-stah (ha!) bisque at Quincy Market, part of the Fanueil Hall Marketplace. Unfortunately, Faneuil Hall itself was closed for renovations, but it was THIS was the place to be for lunch, as lines were long and seating was scarce. After lunch, Sara and I jumped on the train to South Station and then caught an Uber (we did lots of Uber-ing this weekend–such a novelty for us Southtowners who rarely use the service despite its arrival in Buffalo less than a year ago) to Harpoon Brewery. Thanks to our hats and gloves (and the promise of beer! ), we survived a 30-minute wait outside for the next tour. After the tour and a drink, Sara and I headed to the North End for our own pre-race spaghetti dinner. Perhaps we’d done enough walking to justify pasta?? Jessica had given us recommendations and we ended up at Strega. Thankfully, we arrived early enough to grab two seats at the bar before the crowd really picked up. We even enjoyed glasses of red wine–hey! WE weren’t running a marathon the next morning! Marathon Monday dawned bright and early…and COLD. The temperature was in the 30’s with 25 mph winds and 100% chance of rain. Sara’s sister, Annie, donned as much rain gear as she could and headed out bright and early to the start in Hopkinton, while the rest of us enjoyed a slow morning watching race coverage as we packed our bags. Mid-morning, the spectators rode the commuter rail into Back Bay (near the finish) and trudged through the rain to our viewing spot: the Boston Public Library! The library is located AT the finish line and through some seven-degrees-of-separation connections, (Sara’s (other) sister’s boyfriend’s brother’s wife is the executive director or something) we scored the sweetest spot of all to take in the race: the second story balcony JUST ABOVE the finish line. Security was tight, our names were on a list, IDs were required and I didn’t see more than a few more spectators in the library–we felt pretty special. Here’s Des Linden, the first American woman in 33 years to win the Boston Marathon! 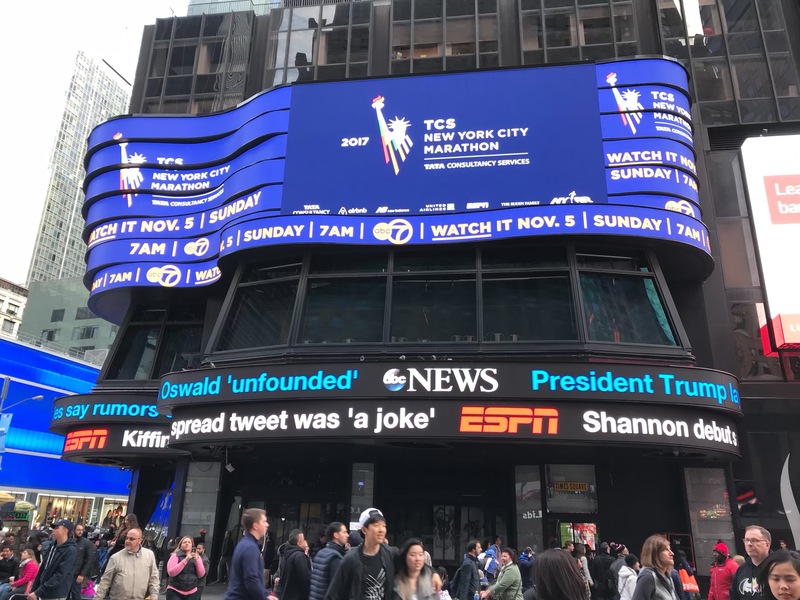 I think is it SO COOL that I got to see both Des in Boston AND Shalane Flanagan in NYC in November, the first American woman in 40 years to win that race. Hashtag fangirl. After the elite men and women finished, we took a lunch break at the mall across the street before heading back into the library to watch Sara’s sister finish. 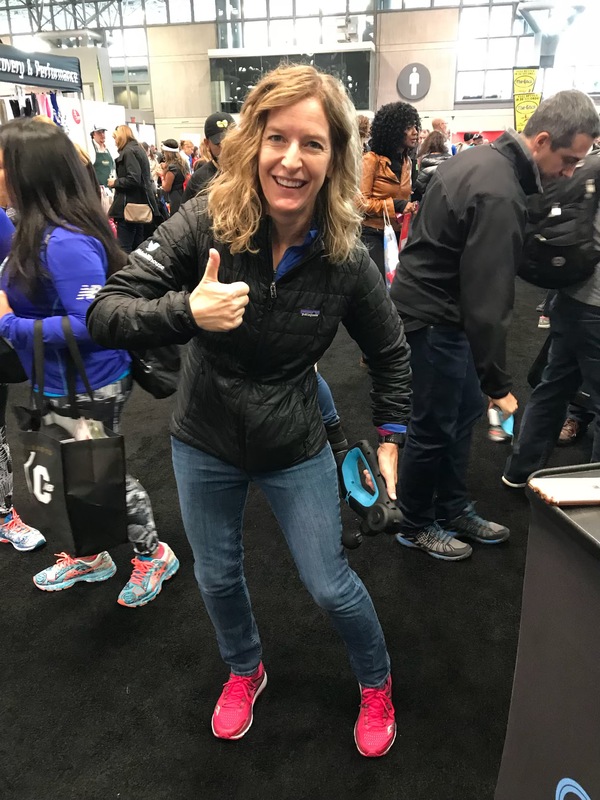 I knew of some other people running the race (friends-of-friends, another running group friend, Insta friends), and with today’s tracking technology, it’s easy to know where your runner is at all times. Annie got some major time on the jumbotron as she approached the finish, and I wish I’d snapped a picture of that! 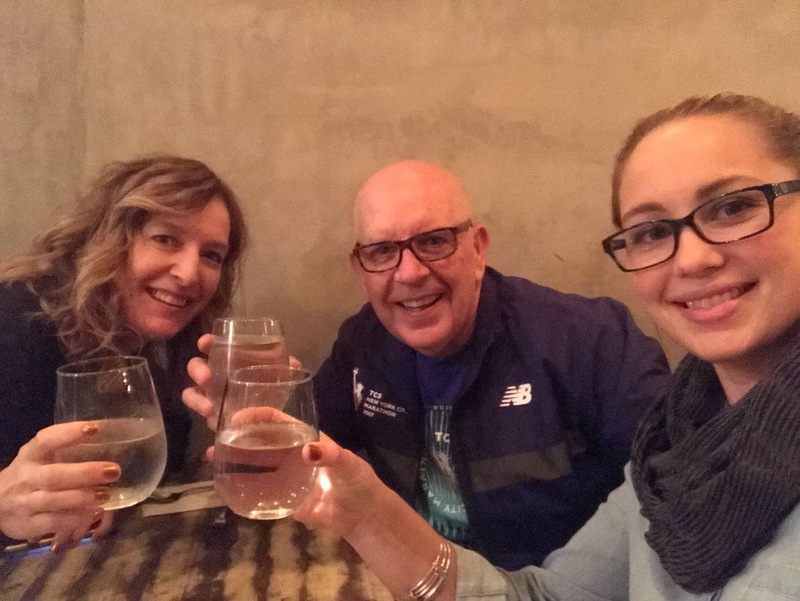 And thus ends an epic weekend trip to Boston for the marathon, a chance to get to know new friends better, a rare opportunity to catch up with an old friend and–last but certainly not least–the beginning of my own journey to qualify for Boston! This weekend was a whirlwind and I’m sure I’ll regret taking a day off when I’m buried in work, but IT. WAS. WORTH. IT. I saved the fruit and nut mix for later, which came in handy the next day sometime after the race. After Ed and I navigated from JFK to Midtown and to our respective hotels, the three of us met up again to hit the expo. Going to the Javits Convention Center and taking in the excitement made me realize how much I missed out on that by doing Erie this year. I remember running the Chicago Marathon and loving the expo. My next marathon will be a big city race! Stacy’s one goal was to find a massage (she’s dealing with some IT issues), and–sadly–there wasn’t one to be had. However, she DID find the next best thing, the Theragun. She fell instantly in love, but the $500+ price tag was just *a bit* too much. Plus, she could totally retrofit a drill to do the same thing–of this I have no doubt. 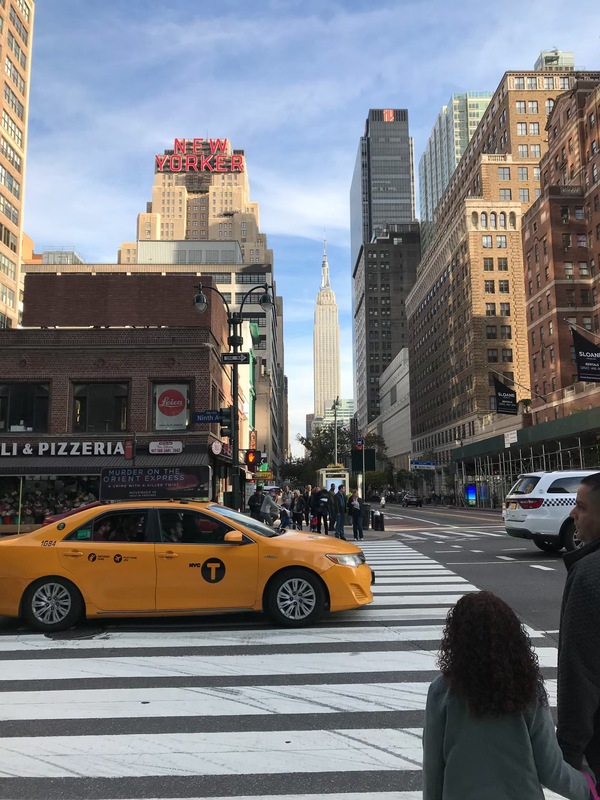 On our way back, we got glimpses of some inherently ‘New York’ things, like yellow taxis, the Empire State Building, and we even took a spin around Macy’s. Andrew and I spent a long weekend in NYC about five years ago and had a blast eating our way through the city, walking our butts off and taking in all the museums. 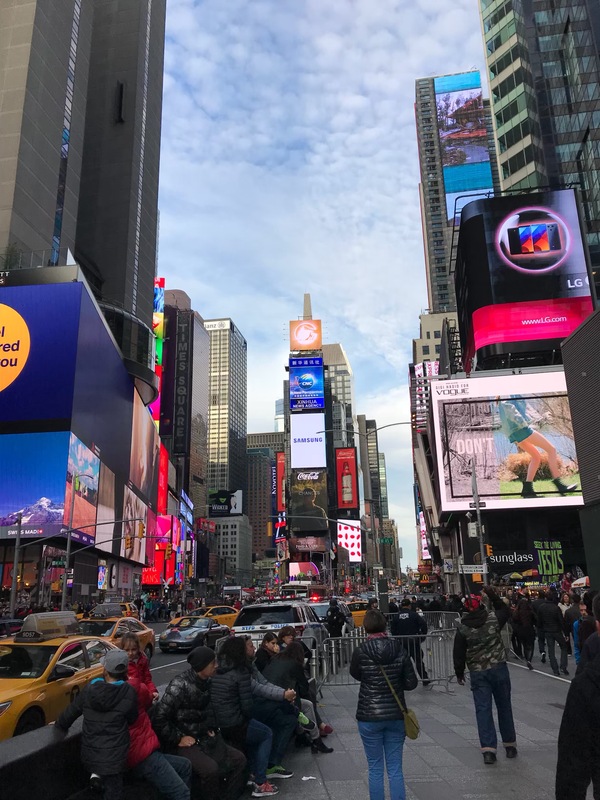 Our hotel was super close to Times Square, and the whole city was ready for race day. Ed’s wife, Gayle, flew in that afternoon and joined us for dinner. Our total bill was $43…split four ways I think that might have been the cheapest dinner to be had in the city that night! Cheers to a great race! After breakfast and before marathon-watching, I met up with a sweet friend from the dietetics program at Buff State: Stevie! She’s working at Memorial Sloane Kettering Cancer Center as a dietitian and living in Astoria, just across the river from Manhattan. It was so fun to catch up! 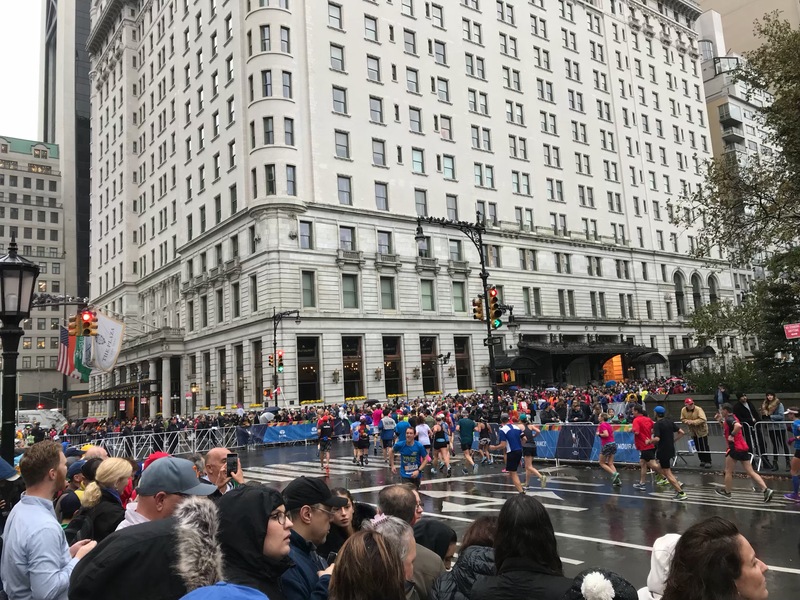 Stevie, Gayle and I hung around near mile 25 (5th and 59th, at the Plaza Hotel) and saw some of the wheelchair racers finish, then decided we should hoof it over to 1st to see if we could catch the elite men and women. We missed the elite women, but caught the men! Meb is in the orange shorts! This was his retirement race. 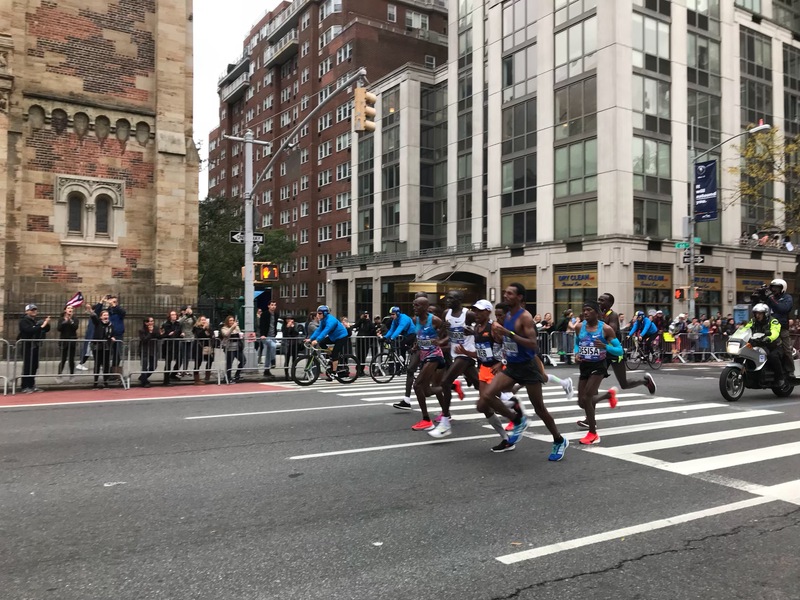 After the men passed, we had to decide what to do next: jump on a subway to Brooklyn and try to catch our runners (who started after the elites) around miles 8 and 9, or try to catch the elite women back where we were at 5th and 59th, just before the finish. To me, it was a no-brainer; I wanted to see the elite women! Gayle and I hoofed it BACK to 5th, just in time to see SHALANE FLANAGAN coming around the corner!!! I felt like such a fan-girl! I love her cookbook, Run Fast Eat Slow (written along with her college running friend, Elyse) and follow her on Instagram, so I knew she was trying to win this one. I was shrieking and trying to both watch her and take pictures. I knew right away she had it in the bag–she was so strong, powering toward the finish and no one even in sight behind her. Go Shalane! 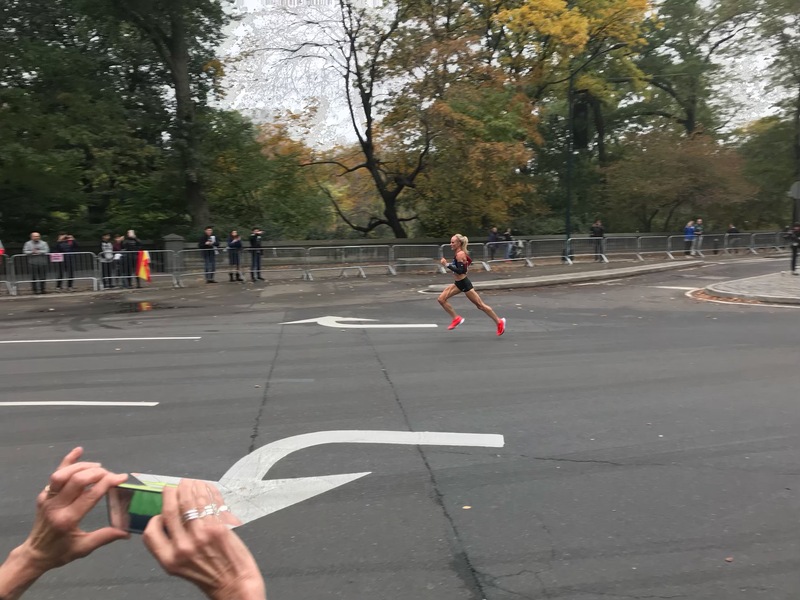 By winning, she ended a 40-year span in which no American women had placed first in the NYC marathon. After that, both of us bouyed by seeing Shalane, we decided it was time to try to see our runners. We tracked them using the app (SO handy!) and headed BACK to 1st, enjoying the crowds and energy and noise. Incredibly, I even ran into the family of an acquaintance of mine, the girl with whom I roomed at the NYSAND Leadership Meeting, because they were carrying around a giant photograph of her! Super small world, and I’m pretty sure they thought I was crazy. 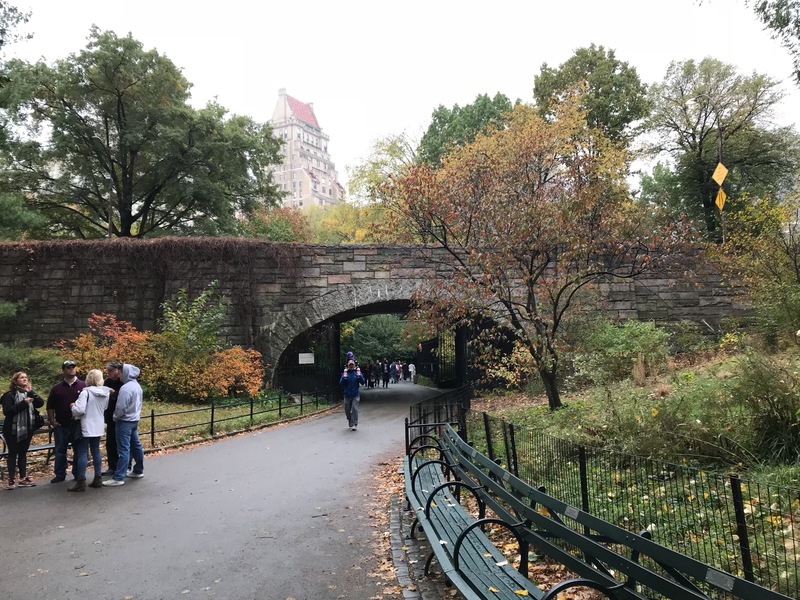 Gayle and I grabbed sandwiches for lunch, then headed BACK to 5th and up into Central Park to try to catch our runners again. This time, success! Here’s Stacy, excited to be less than two miles from the finish! She blew us kissed and ran right on by. She was right on track to break 4 hours. Gayle and I meandered a bit through Central Park as we headed toward the finish area. It’s a beautiful place and I hope to run there next time we visit. 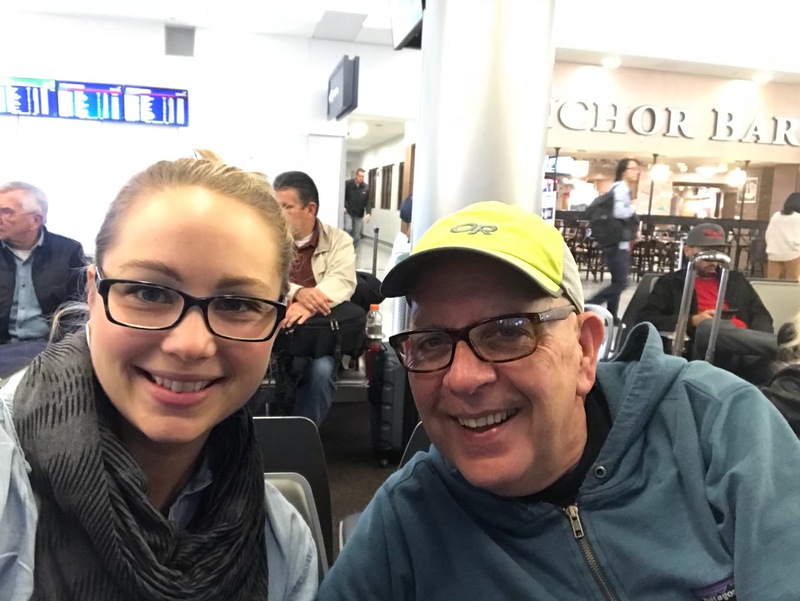 Gayle and I parted ways–she headed back to the hotel to charge her phone and wait for Ed–while I fought the crowds to get to the ‘family meet-up area’ to meet Stacy. Below, that’s the Plaza Hotel! Stacy finished just under four hours and within minutes of her goal. Sadly, we didn’t get a selfie, either! Boo. She and I shuffled with a bazillion other runners back to our hotel, where we spent time visiting with her mom, aunt and uncle, who also came to see her run. Stacy and I said goodbye to NYC early Monday morning, when we rode in a cab in the wee hours while it was still dark. I got a glimpse of Rockefeller Center and decided Andrew and I need to get back to the big city sometime soon. Congrats to Stacy, Ed, and the other 50,000 runners!